My background is scientific. I hold a doctorate in Veterinary Medicine. I have worked for the FDA as a veterinary medical officer reviewing safety data on veterinary drugs some of which are also used as pesticides. For over twenty years I served as executive director and president of the Rachel Carson Council, Inc., a nonprofit that was concerned issues associated with the use of chemical pesticides. Currently I am president of the Rachel Carson Landmark Alliance (RCLA). I am familiar with pesticide hazards for sensitive humans and pollinator populations addressed by Bill 52-14. I support Bill 52-14. Bill 52-14 would curtail certain chemical pesticides used – for cosmetic purposes – on turf. The benefits from reducing usage of these chemicals would be shared by County residents, pollinators and the environment. A significant number of county citizens are considered to be more sensitive to chemical pesticides applied on nearby properties with lawns of over 100 square feet as specified in Bill 52-14. This group includes pregnant women, nursing mothers, very young children, people with compromised immune systems, people being treated for certain cancers, people with allergies to pesticides, and older adults (references available upon request). They would benefit from your approving this Bill. Further recent reports indicate that final commercial formulations (that contain active ingredients as well as other so called “inert” ingredients) are potentially more dangerous to life forms than data from the tests on the active ingredient alone would indicate, more about this later. 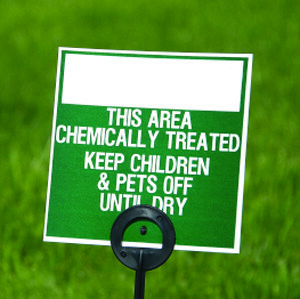 Chemical pesticides applied to lawns may leach through the soil to groundwater and/or run off the turf during rainstorms contaminating streams and tributaries of the Chesapeake Bay as well as the Bay itself. The grass on Montgomery County lawns when considered as a whole is probably our county’s largest single crop. Reducing the levels of “bad actor” chemical pesticides applied for cosmetic purposes on lawns through passage of Bill 52-14 would benefit people, pollinators, the Bay and beyond. As a focus of discussion about the hazards of pesticides, Bill 52-14 could foster greater public awareness of behind the scenes details concerning pesticide product registrations. For example more people we hope will hear how the USEPA does not allow manufacturers of pesticide products to label or advertize their products as “safe, nonpoisonous, non-injurious, harmless or non-toxic…even when accompanied by a qualifying phrase such as “when used as directed.” (40CFR:162.10(a)(5)(ix) Why? Pesticides are registered under a risk/benefit standard by the USEPA and their final formulations are hazardous (just how hazardous is still being discovered). Here is recent scientific support for questioning the safety of EPA-registered pesticide products. Pre-registration testing of pesticide active ingredients takes place without the added ingredients that make up the final formulation of the marketed pesticide product. For example: Roundup is the name of the marketed product, glyphosate is the name of its herbicide active ingredient. In most cases we do not know the other ingredients since they may not be required to be listed on the label. The USEPA does not require chronic toxicity tests for long term exposure of people or wildlife to pesticide products such as Roundup. How is this significant? The regulatory method for determining acceptable daily exposures of humans to a specific pesticide (such as glyphosate) is based on the toxicity tests performed on single active ingredients, not the final formulations (that include active ingredients and other ingredients). If, as seems possible pesticide final formulations are generally more hazardous for humans than the single active ingredients then the current method especially for assessing appropriate long term human exposure to the pesticide products is flawed. Given this possibility here is another reason for users of pesticide products not to regard a pesticide product is “safe” even if used according to the label directions. There has been a rise in autism cases over the years in our country. Recent data show the rate of Autism Spectrum Disorders (ASD) to be 1 in 54 for boys and 1 in 252 for girls. A list of 10 chemical groups “suspected to cause autism and learning disabilities” (Environmental Health Perspectives, April 2012) was compiled in 2012. Two of these groups are pesticide classes: organophosphates and organochlorines. The USEPA has not required developmental neurotoxicity tests – one way of predicting a chemical’s potential for producing ASD – to be performed on single chemical pesticide active ingredients prior to marketing of pesticide products with those active ingredients. As Rachel Carson told us – Lack of data does not necessarily mean lack of harm. Health hazards to humans and pollinators may come from multiple exposures to chemical pesticides with different modes of action. USEPA toxicity standards fail to reflect real-life, multiple pesticide exposure conditions. Please Note: There is no regulatory requirement to estimate the toxicity to humans of multiple exposures to chemical pesticide products having active ingredients with different modes of action. For example: multiple exposures to pesticide products with active ingredients from the organophosphate, pyrethroid, neonicotinoid and carbamate chemical classes is not a parameter that is required to be tested for human health hazards by the USEPA. Bill 52-14 has the potential for reducing applications for cosmetic purposes of certain “bad actor” chemical pesticides and is a step in the sustainable direction. It promises to provide a measure of relief to people and incidentally to pets and the environment from exposure to pesticide products which when not being used for their labeled purposes are required to be disposed of as hazardous waste. Further, it has the potential of contributing to a public discussion of what kind of environment we want for our children. Mr. Leventhal and his staff are to be applauded for bringing the issue of pesticide product hazards and human and pollinator health to the public’s attention with Bill 52-14. Additional information about pesticides can be found on the RCLA web site www.rachelcarsonlandmarkalliance.org. see “Sample Letter to Legislator” and “Sample Letter to Plant Vendor” for details. Concerns for bees and other pollinators: Bees contribute to the successful growing of food and ornamental crops in our county. Scientific evidence from exposure to mixtures of chemical pesticides with the same and/or different modes of action is not required by regulatory agencies for assessing the hazards to bees yet this is the chief way that bees encounter pesticides. Bee hives have been found to have up to 120 pesticide residues. The recent loss of pollinators has prompted action at the highest government levels with President Obama announcing the creation of a Federal Strategy to Promote the Health of Honey bees and Other Pollinators in 2014. The enacting of Bill 52-14 would contribute to this strategy.